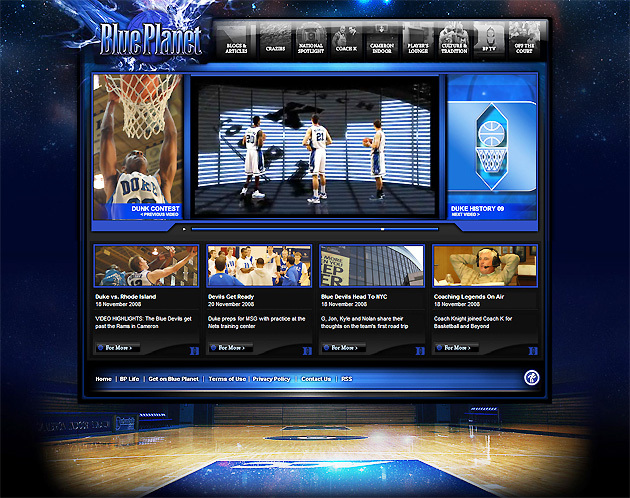 With the start of the new college basketball season off and running now, we thought it would be a good time to profile the site we did for the Duke University Men’s Basketball team located at www.DukeBluePlanet.com. When the site launched in beta format last November it became the first dedicated site for a college basketball program (men or women). We were originally contacted by Duke last June about the project because of our sports site experience and also our site for Coach John Wooden (www.CoachWooden.com). We’ve had the chance to work with a lot of big time high profile athletes and sports brands over the past 5 years, but the Duke Basketball brand is right up there with Dale Jr., Beckham, and Danica for us, so we jumped at the chance to try and work with them. Along with three other agencies we met with the Duke team on their campus for presentations and questions. In mid-July we got the word we had been chosen. Coach K is originally from Chicago, two former players (Deng and Duhon) were on the Bulls roster at the time, and Jon Scheyer from Northbrook is on the current team, so along with us doing the website there was a nice little Chicago connection with Duke. Two weeks later we flew back to have a two-day strategy session going over content outlines, creative direction, interviews with players and coaches, tours of the campus and facilities (as big time college basketball fans it was pretty cool to hoop it up a little inside Cameron Indoor). Basically getting a feel for as much of the Duke Basketball brand as possible. 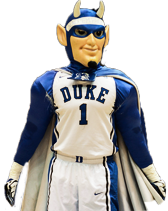 Most college athletic departments have dedicated sites for the whole program, for example Duke’s is GoDuke.com. These include info on all men’s and women’s sports, and are done mostly in template format by companies like CSTV and CBSSports.com, which works with over 200 schools. For schools that have big time programs in football or basketball they really warrant more of an individual and focused presence online. This type of dedicated site is important for targeting four key segments – Fans, Alumni, Program Partners, and most importantly Recruits. In our research we found about 6-8 football programs that had gone outside the circle to produce dedicated sites, but not any basketball programs. With the depth of content and higher quality of design we were looking way beyond anything that had been developed so far with the Duke site. 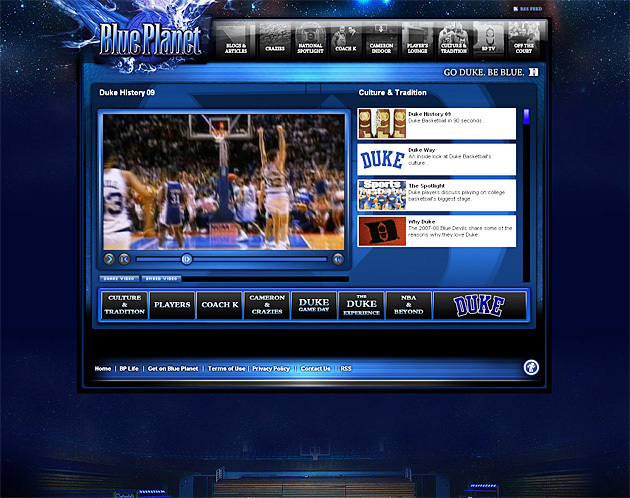 A huge advantage the Duke site was going to have over others, was that Dave (our main contact) also ran a insider magazine called “Blue Planet” (hence the name of the site concept) that has a monthly distribution, and acts as the perfect compliment to the website. He had full access to all assets, including players, coaches, administration, and friends of the program so the content was going to be updated constantly. Once we decided on a content naming scheme, Dave changed up the TOC in the magazine to keep all the messaging consistent, and also includes some of the web designs as page backgrounds. Dave does a truly great job with the information in the magazine, and it makes it so much easier to work with a partner that really drives things on the client side. With an initial decision made in mid-July, then getting our content plan finalized in August, we had 9 weeks to have the site up and ready in beta format for the start of the season on November 9th at home vs. NC Central. After some debate we decided on a hybrid solution to ensure Duke fans of all ages could access the site with no problems, and we included only a Flash navigation and several main section teaser pages. The site includes a full backend content system so that Dave and his team are able to handle all the ongoing content. 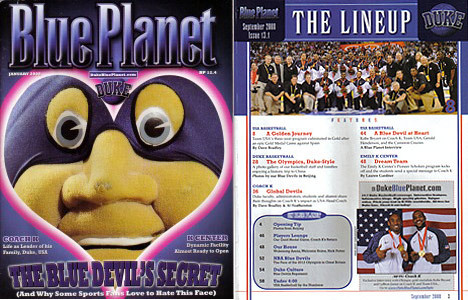 Working on this project was really a lot of fun, we even put up a Duke mini-hoop in the office and created three different games we still play today: best of 3 for the Duke cup, best of 5 for the Duke beannie baby, and the crown jewel – best of 10 for the Blue Devil bobblehead. 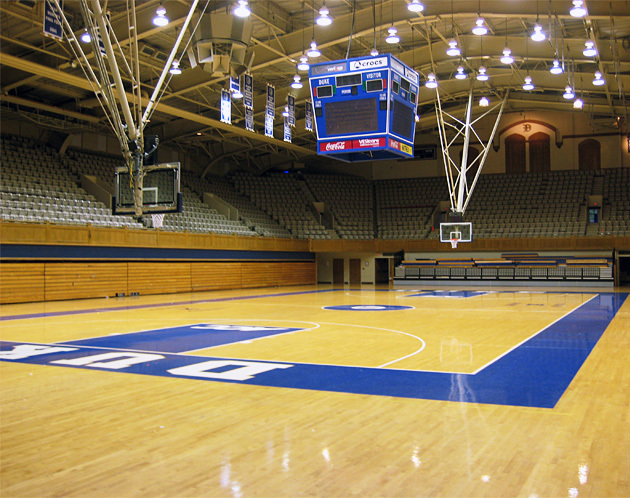 Content is broken out into nine sections dedicated to all things Duke Basketball: Blogs & Articles, Crazies, National Spotlight, Coach K, Cameron Indoor, Player’s Lounge, Culture & Tradition, BP TV, and Off the Court. “Player Video Blogs” – one of the favorite fan features showcases player’s behind the camera from trips to other Duke sporting events, to former players back on campus, to facility tours, and more. “Meet the Crazies” – you’ve heard about the them, you’ve seen them on tv, now you can meet them. 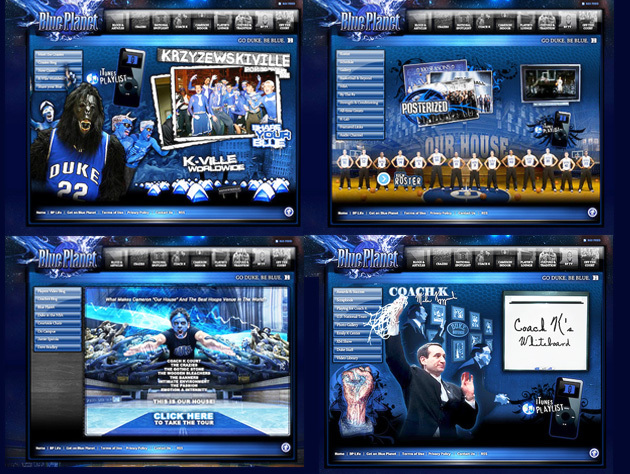 “K-Ville Worldwide” – an interactive feature that allows fans to add and customize their tent online from anywhere in the world. “Coach K’s Whiteboard” – using Coach K’s actual writing as a font and showcasing some of his favorite words and their meaning. “Cameron Indoor Historical Slideshow” – showcasing the history of Cameron from its early days through today with captions for each photo. “BP for the Record” – a section focusing on Duke stats for academics, ACC, Coach K, national spotlight, players in the NBA, NCAA tournament, in the polls, and number of wins. “Basketball & Beyond” – includes a profile of every player to wear the Duke uniform throughout history, and their current occupation. “The Duke Experience: – photo tour with detailed captions of some of the integral parts that make up life at Duke. We took a couple weeks to go back and test things more thoroughly and added one of the main features targeted to recruits – BP TV. 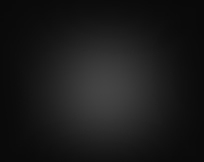 In this section we house all the videos that can be directly linked out to users. Along with custom videos shot and produced on campus and displayed on the site, a dedicated YouTube channel, SmugMug feature, and FaceBook page was setup to also help drive traffic. The primary driver of the site is continually updated content and video. Dave’s staff does a great job of producing really interesting and unique content that you can only get about the program from this site. The site will continually evolve and there’s a list of great new features we’ll look to be adding during this season. The team that worked on the site was lucky enough to head out to Duke for the March 8th game vs. North Carolina (which behind the Masters is the toughest ticket in sports). In case you’re not up on college ball, this is the biggest rivalry in bball, and perhaps all of sports. Duke was ranked 5th and UNC was #1 going into the game. We got on campus around 3PM, and the excitement was there from the moment we started walking around – the tents, kids wearing their Duke gear, some Crazies already getting into costume. Around 6:30 we headed back over to K-Ville to meet up with Dave and get our tickets (3 rows behind the Duke bench – awesome seats). We’ve been to some big sports events over the years with the people we work with, but this was on another level. Crazies came running in to get their seats. Eventually players from both squads started filtering out for warm-ups (NC players being hazed as soon as they came from the tunnel). Also many former players and celebs (Peyton, Eli, Matthew McConaughy, etc.) were in the crowd. From the opening tip the energy never died – it got hot and loud quick. The Crazies were as advertised (best fans in the biz by far). There were some recruits around us, and you have to wonder how in the hell after being in that atmosphere how they could go somewhere else. NC got ahead early, Duke fought back after halftime, but UNC was too much down the stretch after being tied at 68 late in the game. Props to Bikini Guy and Old Crazy Towel Guy and all the Crazies for an awesome show. DukeBluePlanet.com currently stands as the most in-depth college sports program website online today, and its taken the dedicated team site concept to entirely new level. Duke’s program with Coach K is really the model for all college sports programs. The success, the tradition, the longevity – ESPN.com and USA Today have recently done polls that show Duke is the most popular basketball program – and it was a privilege to help them take their brand online in a first-mover fashion.